I go through phases of loving soup and making it lots then forgetting all about it and not making it for ages. 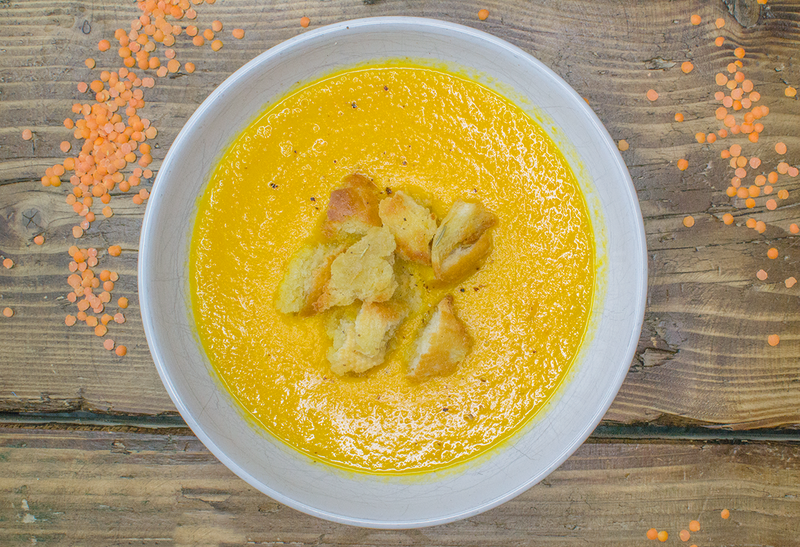 I’m currently in a soup loving phase and this carrot, ginger and orange vegan soup recipe is my favourite right now. I love the bright, vibrant orange colour of it and as it still feels like winter it’s a good way of getting lots of cold-busting vitamins into us. It’s super simple to make too. I added onion and garlic onto the recipe as they are generally the base for all sauces and soups but I actually don’t usually bother adding them because I’m lazy and can’t be bothered to cut them up! The soup is perfectly tasty either way. Plus it’s completely vegan, dairy free and egg free. I use this stock powder but you could also use crumbled up stock cubes, or of course homemade stock. I made the croutons with some stale baguette than I had lying around but you could use any kind of bread, just tear it up into little pieces. Stale bread is better than fresh bread. I added rosemary as I love it but you could leave it out or use a different herb, you could even use chilli oil if you wish. Or garlic oil for more flavour. Heat the oil then add the onion and fry until softened. Add the garlic and ginger, stir. Add the sliced carrot, red lentils and stock powder then stir. Add the boiling water then simmer on a low heat for about 45-mins to an hour. Check the carrot is completely soft. Blend the soup then squeeze the juice of the oranges in and stir. If you the soup is too thick then you can add a little extra water. Tear the bread up into small pieces then mix into the oil and rosemary. You can then either fry or grill them until crispy.